Here at Paragon Training, we are dedicated to helping develop our athletes and challenging them to pursue excellence in all facets of their daily life. We work with swimmers, cyclists, runners, and triathletes who count sport as an integral part of their lives and assist them in achieving their goals. 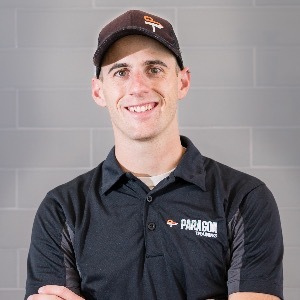 Mark Saroni is the founder and Head Coach of Paragon Training. Mark has been involved in triathlon since 2003 and has been coaching fellow athletes toward their goals for nearly as long. Saroni's unique coaching style and knowledge is built on years of racing, including four years as a professional triathlete. His education is also a key component in training his athletes. In 2011, Saroni graduated with a Masters degree in Kinesiology from the University of Texas at Tyler. Saroni's most recent accomplishments are winning both Ironman 70.3 Buffalo Springs Lake and Ironman Coeur d'Alene in 2017. As a younger athlete growing up in Dallas, Texas, Saroni was already earning multiple accolades. Saroni recorded top-ten finishes at both the USAT Junior ITU National Championships and the ITU Age Group Championships. Saroni was also a three-time USAT All American and top-ten finisher in the 20-24 age group at Age Group Nationals. He was the #1 ranked triathlete in the South Midwest Region in 2011. Saroni went on to race professionally from 2012 to 2015. As premier athlete and coach in South Texas, it is Saroni's mission to assist others in their pursuit of excellence. He loves working with athletes of all ages and ability levels. From two year-olds, to nationally ranked junior triathletes, to adults in their 50’s and 60’s learning how to swim, Saroni enjoys spreading an enthusiasm for endurance sport. A passion for sport, a willingness to work hard, and a desire to pursue excellence. Success. Coach Mark Saroni has been notified of your message.